Of course, now that we’ve got another big fluctuation (the most recent month) it’s a lot harder to give the false impression of no warming. The fluctuation right now is big, about the same size as the fluctuation was in 1998. But the trend value is significantly higher than it was, so the temperature — trend plus fluctuation — is the hottest we’ve seen yet. If you found this essay helpful, please help by donating at Peaseblossom’s Closet. This entry was posted in Global Warming Basics and tagged Global Warming Basics. Bookmark the permalink. Economics says that renewable energy generates more jobs. Economics says that the only way to protect the economy is a reasonably stable climate. The claim that protecting the environment will damage jobs and the economy is advocacy oratory by folks that had over “invested” in carbon fuels and were/are trying to protect that sunk investment. Folks that are (emotionally) invested in obsolete technologies lie. Facts and good math do not change their mind set. We have to fined a way to get them emotionally invested in the truth. BTW the NYT today published a blistering editorial (by it’s Editorial Board) on the gutting of CSIRO. I have a couple of questions for Larry Marshall – what exactly is “the climate we will be living with?” And how does he know? Bernard, The fact is that people who claim we need to adapt do not expect to be among the future generations trying to and having to deal with the problems. They also do not care about the troubles any other humans (or other life) face as a result the way they want to get away with personally enjoying ‘their’ life. They need to be asked if it is decent to be so callous. First chart’s explanation of monthly anomaly. Why should Jan and July not be directly comparable, globally? July hotter than January only from a northern hemisphere POV. Is there really seasonal variation in global temps, if so why? Here can you see the seasonal variation in global temps, land and sea. Great post/series. To keep the article self-contained it would be useful to indicate the anomaly baseline for the graphs. Climate change in a clear, concise set of charts. Please pass on. Very clear, yet comprehensive. Thanks. Found helpful, donation sent, pointers posted elsewhere. You’re doing what I can’t do. Those who can’t teach, point to good teachers. Very well done, and quite comprehensive. Thank you! It might be useful to take some of those graphs back further. That would illustrate how unusual they are in the context of the past few thousand years, and how much further we potentially have to go (e.g. 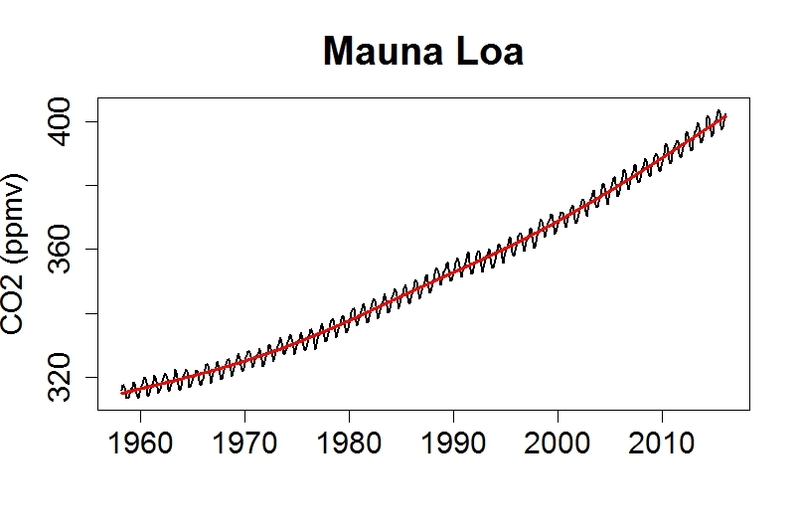 tens of metres of sea level change). Do I interpret this as over the last century this represents a 13% temperature rise in just the last year? When the temperature for 1998 came in, there was alarm at the rapid increase in temperature. But it was a blip in the trend. The trend is worrying enough on its own, without thinking that the occasional sudden upward blip is the start of a dramatic acceleration. What is concerning is that as the shock of 1998 faded, the urgency to do something about global warming faded. When the temperature for 1998 came in, there was alarm at the rapid increase in temperature. Was there? I went googling for such once upon a webchat and concluded that not much fuss was made about that single year. My point then was that realists look at the long-term trend. Could you provide a pointer or two, John? gosh golly, Barry, I found a bunch. Of course you won’t find all that much by googling because the Internet was still young and much data printed on newsprint paper. So the press releases were aimed at printed press. The World Meteorological Association in 1998 http://reliefweb.int/report/bangladesh/el-ni%C3%B1o-1998-global-surface-temperature-highest-wide-margin This is a great overview. There is plenty more if you drop down past the first 2 pages of search results. Barry, I’m relying on my memory. I remember much being made of the warmth in 1998. Thanks richard, appreciate the links. I didn’t search under those parameters. I’m not sure if I should be disappointed or not. 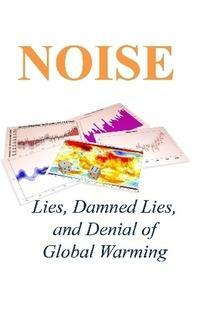 Critics are derided for taking a low annual anomaly and sarcastically asking where the warming is. When we call them on it, emphasising the importance of long-term trends and playing down the spikes, they reply that ‘we’ do exactly the same every time there’s a hot year. Maybe they’re right. While I sympathise with getting the message out that the world’s surface is warming rapidly, I can’t help feeling we concede the high ground when we lean on a short-term event, just as critics do for their agenda. It’s inconsistent, if not plainly hypocritical. Although… I don’t really see the “shock” that John refers to in those articles. WMO said to “heed the anomalies,” whatever that means, and take action. But these are mostly scientific reports. I’ve no doubt that the record was reported, I had doubted that the single year’s anomaly was a source of “alarmism.” But I wasn’t tracking the topic back then. Perhaps there are other articles that do just that. And don’t forget that absolute temperature is the only type of temperature scale in which percentage increases are meaningful. Earth’s temperature has risen to 288 from 287, which would be a 0.35% increase. 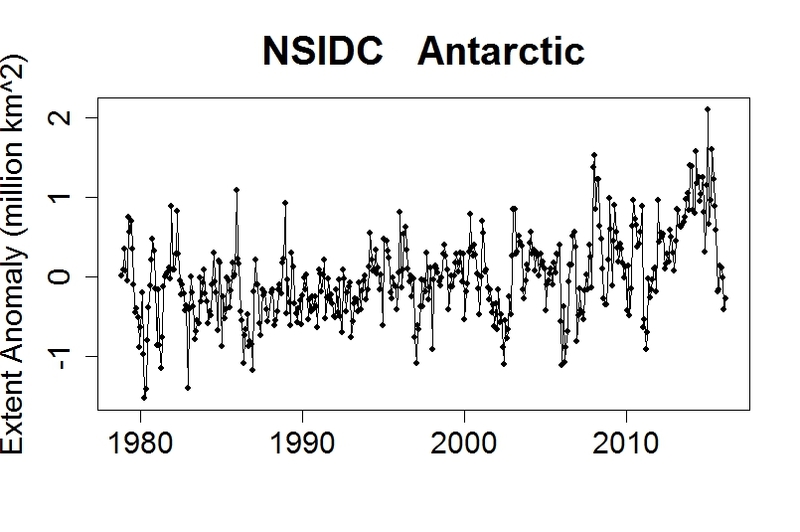 The melting of the Antarctic land ice is much too small in extent to account for the increase in the Antarctic sea ice extent over the course of the southern hemisphere winter (almost all of it melts during the southern hemisphere summer). The main factor is the increase in the circumpolar winds in the Southern Ocean around the Antarctic continent. Due to the coriolis effect, a portion of these westerlies tend to drive the ice to the north. In the cracks which are so caused in the ice the air is so cold in the winter that new ice forms right away. So the question is what has caused the circumpolar winds to increase in recent years. The papers which I have summarized in the previous paragraph do not seem to provide consistent answers, but possibly the ozone hole above the South Pole contributes. Please note the “half the size of the increased freshwater supply from the Antarctic Ice Sheet” part. Ocean salt water freezes at about 28 degree F, while fresh water freezes at about 32 degrees F. This massive increase in the fresh water supply (roughly twice the increase in Antarctic sea ice volume) makes the water ever less saline and thus allows it to freeze ever more easily at ever higher temperatures (up to a point, of course). in quotes from them that not only are those who say that this increase in Antarctic sea ice argues against global warming are wrong, but that we can actually *expect* greenhouse warming of the globe to increase Antarctic sea ice for decades before finally reversing itself. I stand by what I wrote but am not going to provide more details just now from this mobile device. I’ll just state that the situation is more complex than your comment seems to indicate. Roughly, the extra thickness might well be due to fresh water but not the area. Freshwater is less dense than saltwater, which means that freshwater can “float” on saltwater. This means that if the ever increasing and very large supply of freshwater can at least help explain the increase in the volume, then of course it can at least help explain the increase in the extent as well. That is, to a sufficient degree, the ever increasing and very large supply of freshwater (whose volume at the time of that study a couple of years ago was twice the increase in Antarctic sea ice volume) can essentially stay at the surface and thus eventually fan out over an ever larger area and decrease the salinity of the saltwater at the surface with which it mixes, and thus raise the temperature at which it freezes. And so we have not just more volume but greater extent as well. 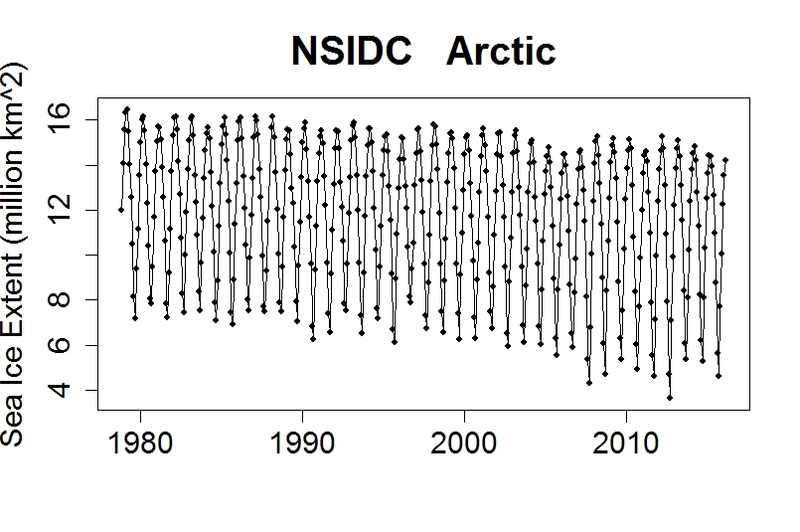 “Why is southern sea ice increasing?” on Skeptical Science is quite thorough and offers a most helpful commentary. I will point out that with a typical wintertime temperature of -20 °C at the Antarctic coast it doesn’t matter much whether the surface water is fresh or salt; other factors are in play. It is so cold in the Antarctic even in summer that there is little surface melt. The melt occurs at the base of the glaciers from warm sea water coming in contact with the ice. This melt occurs all year so it can potentially provide a fresh water source even in the winter. My understanding is that scientists are still working on the relative contributions of fresh water supply and wind as causes of increase in sea ice. 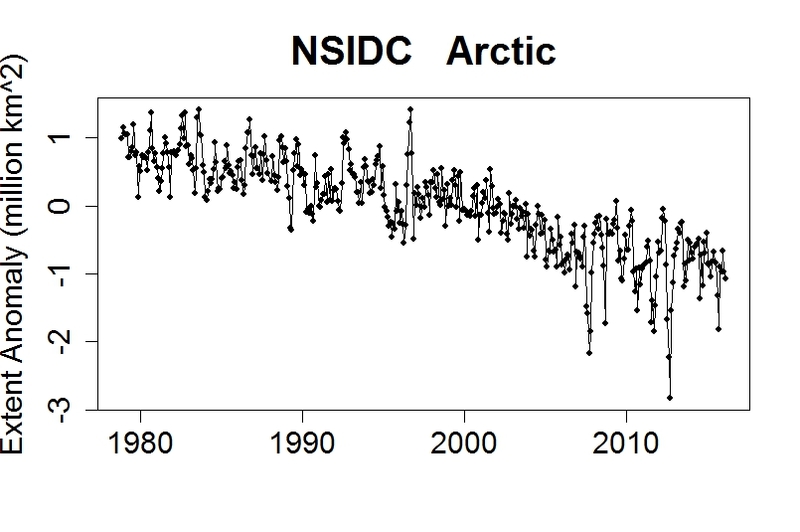 Hansen claims: http://csas.ei.columbia.edu/2015/09/21/predictions-implicit-in-ice-melt-paper-and-global-implications/ that increased subsurface ice melt causes decreased ocean surface temperature in addition to decreasing salinity. Both these effects increase sea ice. The measured sea surface temperatures around both Antarctic and south east of Greenland are cooling. He thinks that the measured increase in ice implies that the Antarctic is melting faster than expected and sea level rise will be worse. We can all hope he is incorrect. During northern hemisphere summer the Earth is farther away from the sun and solar irradiance is 6% lower than Austral summer. 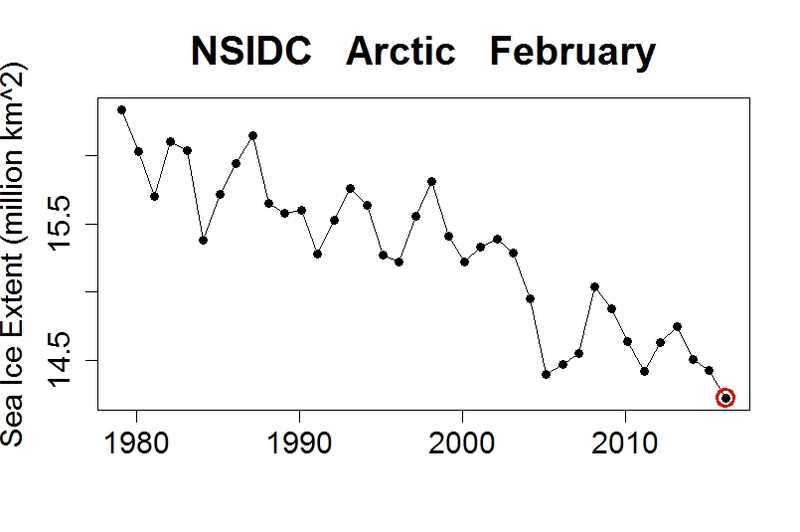 We don’t see any difference in the anomalies because they take out seasonal variation. However, is there a difference in the actual global temperature between aphelion and perihelion? The difference in irradiance suggests there should be, but my impression is that there is not. 2nd question, if not, why not?! Another factor is that when the earth is closer to the sun it moves faster so the extra light is compensated for by the shorter days and shorter season. 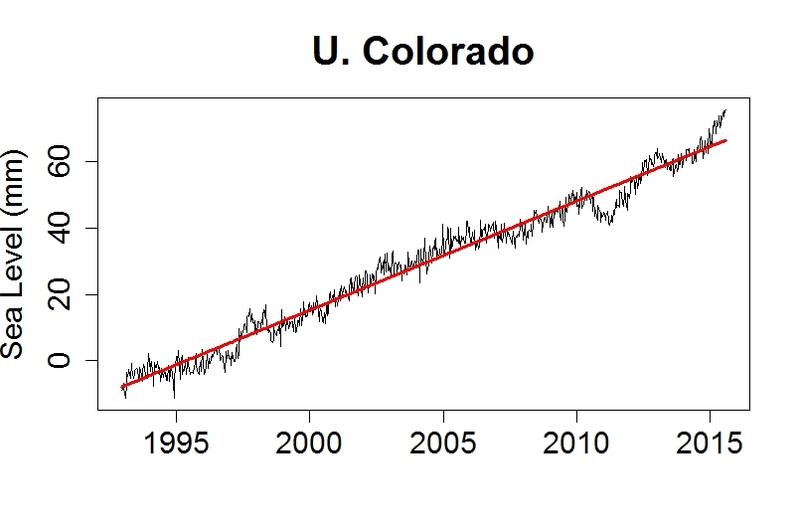 University of Colorado have released the latest sea level data to the end of 2015. [Global] Sea level has risen sometimes faster, sometimes slower, but it’s faster now, and in fact is faster than it has been for at least 2500 years (perhaps a lot longer). To statistical significance? Particularly regarding the tide gauge/satellite period/s. I understand and accept all of the plots showing an upward trend in temperature, etc. 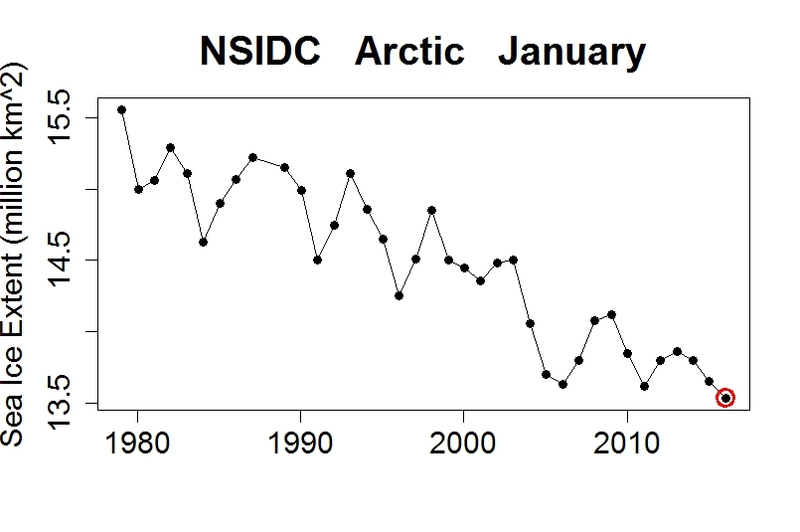 and downward trend in ice, etc. I also accept that humans have increased the amount of CO2 in the atmosphere. 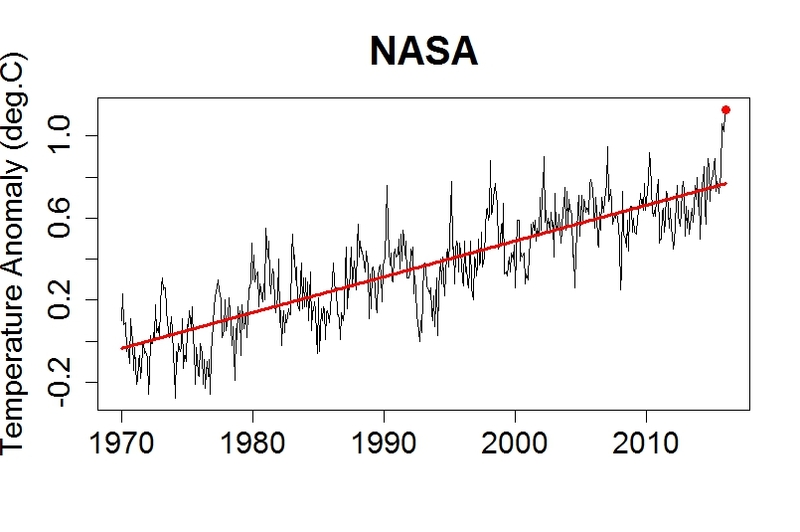 My question is: What is the evidence that the increased CO2 is causing the warming/thawing? Is it possible that we are just in a “warming trend” and there’s nothing we did to cause it and nothing we can do about it? [Response: Law of physics. 1) CO2 (and methane and water vapor and others) is an infrared-active gas, and that inhibits Earth’s cooling radiation to space. 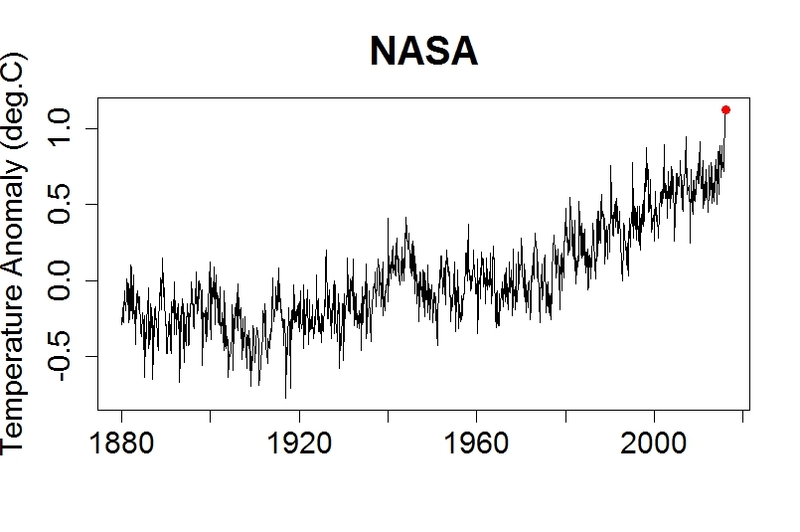 2) Earth’s global temperature doesn’t change dramatically for no reason. Thank you for taking the time to answer my question. This is exactly what I was looking for … the fact that there are not just random warming trends and that there needs to be a reason. A naive question: what brought about warming trends through out history? [Response: There are very many reasons. Example: the sun’s energy output has been variable by quite a bit over the very long haul. It’s sometimes referred to as the “faint young sun,” because, as astrophysicists have learned, the sun has slowly heated up as it has aged. There are also shorter-term fluctuations, but there’s no solid evidence they are an important influence today. Another example: Earth’s axial tilt, and the orientation/shape of its orbit. These are subject to fluctuations (on time scales of tens of thousands of years), and are a primary trigger for the onset of glaciations and deglaciations. They have only a minor influence on the total solar energy we receive, but strongly influence how it’s distributed. That can cause the buildup or decay of polar ice masses, which alters Earth’s reflectivity, which *does* alter the total solar energy we absorb. Another example: episodes of tremendously enhanced volcanic activity can alter the concentration of greenhouse gases (esp. CO2), with its concomitant climate effect. Note that even these events (which are linked with past extinction events) aren’t changing atmospheric CO2 as fast as we are. Another example: as the continents drift, they alter the patterns of global ocean circulation. Keep in mind that in 1825 scientists predicted that CO2 would cause the globe to warm. At that time the globe was cooling, although no data was available to show it. In 1896 Arhenius predicted how muc hit would warm and was pretty accurate. So in addition to explaining what is causing the warming and why CO2 is not causing it, you have to explain why scientists correctly predicted that it would start to warm (and how much it would warm) when they had all the science wrong. Got to quibble a bit there. 1825 was the approximate date that Fourier inferred the existence of what we now call the greenhouse effect. But though he knew it was caused by the atmosphere somehow, he had no idea of the mechanism. The discovery of the role 9f CO2 (and water vapor) had to wait for John Tyndall in 1859. I read recently on some pro-CO@ denier site that the CO2 greenhouse effect drops off quickly after a certain point. Is that true? This is about the simplest I’ve found, it’s known as the ‘Curve of Growth’. Do any of your graphs go back further? I know part of the problem with that is it may pre-date direct measuring and rely on other, possibly less exact methods. But I thought I have seen some graphs which try to diminish certain trends when viewed over hundreds or thousands of years. For example, a version of your first graph that make it look like a normal sine wave for millennia. Always want to have the most information. Great post! Very well put: calmly, clearly, and concisely. [Response: Generally, versions of global temperature which “make it look like a normal sine wave for millenia” are either grotesquely in error, or downright fraudulent. It’s because of concerted efforts to discredit the work of climate scientists. Genuine estimates of temperature on time scales of several millenia make it look like modern warming is unprecedented, downright alarming. That’s why they’re so often attacked. Just about every piece of evidence has been attacked, often viciously. It amazes me the depths to which some will sink to deny what’s true. Two excellent sites for reliable information are RealClimate (by actual climate scientists) and Skeptical Science (which focuses on debunking misinformation). Which got me a choice to go directly to the picture (i like pictures). Near the top was a good SkepticalScience collection and my favorite NASA climate change, which is doing a good job with visuals and clarity, focus, and clearly labeled coverage of all the different things that are going on. I suppose if one regards the other five great extinctions (over the last million years) as peaks on a wave (though they are not regular) and ignores the absence of life supporting conditions during those peaks, one might pretend this is something other than what it is. What happens if we add more carbon dioxide? In the layers so high and thin that much of the heat radiation from lower down slips through, adding more greenhouse gas molecules means the layer will absorb more of the rays. So the place from which most of the heat energy finally leaves the Earth will shift to higher layers. Those are colder layers, so they do not radiate heat as well. The planet as a whole is now taking in more energy than it radiates (which is in fact our current situation). As the higher levels radiate some of the excess downwards, all the lower levels down to the surface warm up. The imbalance must continue until the high levels get hot enough to radiate as much energy back out as the planet is receiving. Great post. A pet peeve of mine is graphs labelled in some giga-incomprehensible unit. The ice sheet melting graph should be labelled in mm of SLR equivalent (and please, not in volumes of Lake Huron, as one “science journalist” did). 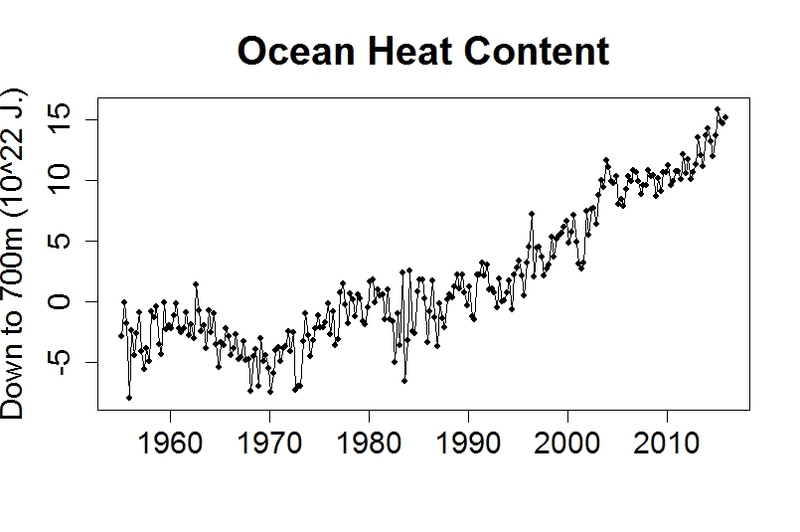 The ocean heat content should be in units of the amount of heat required to warm the atmosphere one degree. This is actually quite shocking – it is equivalent to dozens of degrees of atmospheric warming. as done by Fourier and Arrhenius. This concrete calculation I think would help, in arguments with scientists/engineeers, even without any attempt to calculate the temperature rise from the heat. I have a question, because I’m confused about the long term trends, in particular in the troposphere data. Although you emphasize the long term trend line in the chart showing 1980 through 2016, the data goes back much further than this and in fact shows a flat trend when the troposphere cooling from the 1950s through the 1970s is included. 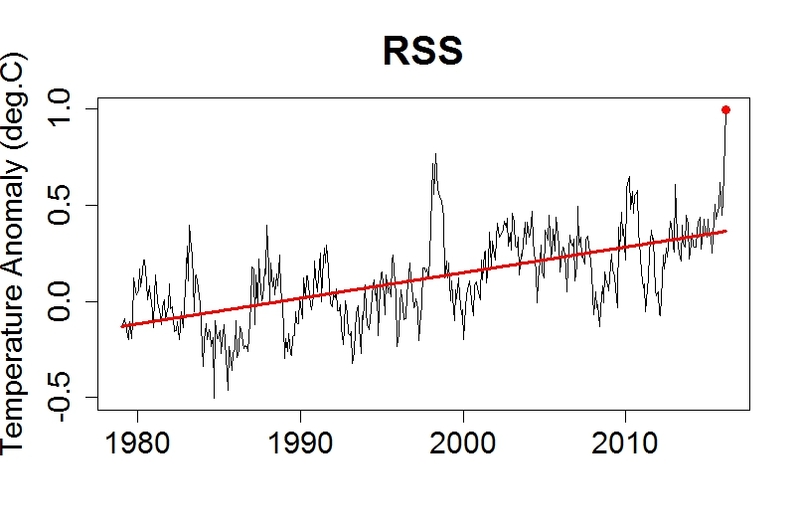 This is outlined in a recent article at http://realclimatescience.com/2016/03/noaa-radiosonde-data-shows-no-warming-for-58-years/ about the NOAA troposphere data. I haven’t heard any convincing explanation of why there would be over 20 years of cooling in the 1950s through the 1970s (during which there was obviously a lot of fossil fuels being burned and a lot of CO2 being produced) if the current theory about the cause and effect of global warming is correct. How can we be sure of the theory if evidence from our own lifetime seems to contradict the theory? [Response: Satellite data only begin in 1979. Data from weather balloons (radiosonde data) contradict the claims in that post. You can see a sample of the entire time span according to radiosondes here (data from RATPAC, for “Radiosonde Atmospheric Temperature Products for Assessing Climate”), from this post. And by the way, the atmospheric layer from surface to 100mb includes a goodly portion of the stratosphere (which is cooling because of CO2), not the troposphere. You might consider why he splices an old version of that with modern data from different atmospheric layers. My advice: the site you refer to is that of a notorious climate denier, don’t trust anything from it. I noticed that, too. My comment at that deity-forsaken site has been in moderation for a while. Splicing surface-100mb with lower layer atmospheric temp profiles? 100mb is well up in the lower stratosphere, which as we know has a long-term cooling trend (predicted from GHG warming). This splice throws a few oranges in the basket of apples. Goddard’s post was brought up in the comments at realclimate, where a different reply was given. I had heard the aerosol response before but it always left me wondering if that’s really the answer and aerosols have such a massive cooling effect, why wouldn’t we just go back to using aerosols?? [Response: The problem with the aerosols from industrial activity is that they’re sulfate aerosols. This leads to the problem of “acid rain,” which is why Europe and the U.S. enacted laws to limit their increase in the 1970s. They also settle out of the atmosphere quickly, so they’d have to be constantly replenished. But the idea of injecting aerosols has been suggested, under the broad umbrella of “geoengineering.” This can have unanticipated undesirable consequences. I consider it ill-adivsed to tamper further with a system we don’t sufficiently understand. If one is going to deny that global warming is caused by humans their argument will follow something like – we are so small and the earth’s atmosphere is so large how can we possible fill it with enough of anything to make a difference. So as I read your post I was hoping to see some real mathematical-based arguments on this – but I was disappointed when I got to that part in your post where you glossed over it with hyperbole and said “You can’t dig up billions of tons of carbon, burn it, dump all the CO2 into the air, then say that the rise of CO2 has nothing to do with us…”. Has anyone actually done some math like this that computes the amount of Carbon burned by the industrial word over the last 100 years or so and shown the result in terms of the amount/volume of CO2 released – and then compared to the total amount of CO2 in the atmosphere, figured the increase is CO2 concentration and then the result in increased temperatures. And when were shown graphs of climbing CO2 (like the one above) there is never any reference to the total. Is the amount of CO2 going up by 1% a year, .0005% a year or 10% a year or something else? Clearly the thermal properties of a “CO2 blanket” wrapped around the earth are related to CO2 concentrations in the atmosphere – not the raw amount of CO2. In other words I would love to see something that says – Since the start of the industrial revolution we’ve burned roughly X tons of carbon resulting in Y amount of CO2 gas being released. This is Z% of the total COS that was in the atmosphere pre-industrial revolution. We estimate B% has dissipated and we are therefore left with a net increase (versus pre-industrial times) of X amount of COS which is X% on a parts-per-million basis more than pre-industrial times. The thermal properties of such an increase in COS concentrations, based on the physics, would make the atmosphere X% more efficient at retaining heat. With this we would expect to see an average temperature increase of between A and B degrees Celsius. Compared to actual observations of an increase of X degrees Celsius. Without something like the above its hard to show this to be a man made event. I know its complicated – but again you guys are weather scientists. Don’t have the numbers handy, but a good illustrative analogy on the optic disruption 400 ppm can potentially cause is to calculate how many ounces of house paint you have to pour into an Olympic-size pool to reach 400 ppm. It is quite a different thing to say “I haven’t found anything” than it is to say “it doesn’t exist. Perhaps you haven’t looked hard enough, or perhaps you don’t know how to interpret the information you are finding to get the information you want. I’ll get you started. The mass of Earth’s atmosphere is about 5.1E18 kg. The concentration of CO2 increased roughly 4 parts per million by volume (ppmv) out of about 400 ppmv, or about 1% in a year (note, this was somewhat anomalously high, due to the ongoing El Nino, but it gives you the order of magnitude). A 1% yearly increase equates to a doubling time of about 70 years, which equates to about 2.8 degrees warming globally. All this stuff is out there if you bother to look it up. Every carbon fueled car has an impact. . Most people drive gasoline powered cars without much of a thought. Opinion manipulation campaigns have us convinced we have little impact – but a very simple rule of thumb is that a typical gas powered auto will put a pound of CO2 into the air per mile traveled. A billion cars in the world. cough. “U.S. daily travel averages 11 billion miles a day”. But CBS is more dramatic with the totals from all sources:: The global rate of CO2 emissions is 23 million pounds per second. http://www.cbsnews.com/news/carbon-dioxide-emissions-rise-to-24-million-pounds-per-second/ That data is a few years ago. Which points to another line of evidence: the very small but measurable decline in atmospheric oxygen. Or refer to the geologic record. Last time the atmosphere gained 100ppm CO2 was from natural causes over ~4200 years, remaining fairly stable ever since the Earth climbed out of the last ice age 10K years ago. The recent rise in CO2 concentrations of 100ppm took ~100 years (from 1910). 40 times faster. We don’t have a geologic analog for a rise that much that fast. Over the 5000 years climbing out of the last ice age the Earth’s surface warmed by ~5C. 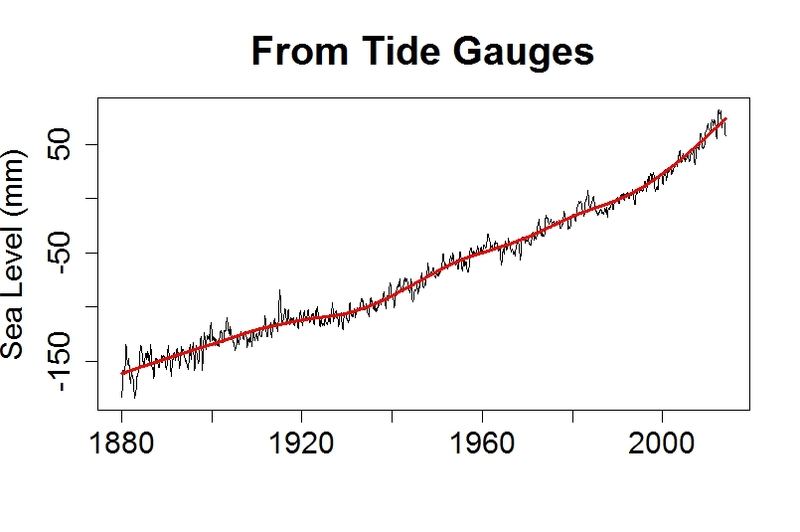 (The oceans rose more than 100 meters) It has warmed by about 1C since 1900. Ten times faster, and we haven’t experienced the lagged effects ‘locked in’ due to the thermal inertia of the oceans. The earth’s heat budget is out of equilibrium and must eventually catch up – some decades after the point that we stop emitting CO2 (slow feedbacks may still occur beyond). It’s not just the fact that surface temperature changed in the past as it is now – it’s the rate that is the key issue. Our civilizational infrastructure could cope quite well with a 2C warming over 2000 years. But 2C or more over the next 100 years? Think of it – 100 meters of sea level rise from 5C warming. Another 5C wouldn’t bring another 100 meters (less ice), but it would still devastate the world’s coastlines. And the fact that we can’t pin down the resulting sea level rise is not a case for complacency. The fact that we find it difficult to narrow the range for the response to GHG increase is not a cause for a complacency. It’s not because we don’t know how bad it will be, but that we can’t be sure it won’t be catastrophic that We. Should. Stop. We’re conducting an unguided, planet-scale experiment with the only atmosphere we have. We’re inside the test tube and we can’t get out if things go drastically South. Stopping will take a little time if we don’t want to wreak havoc with the world’s economies, so the sooner we start hitting the breaks the better, and the smarter we hit the breaks the better. That’s why those arguing for delay or denial, whether tacitly or directly, are reckless, shortsighted, self-serving or worse. We can quarterback at the end of the century to see who was right and who was wrong, but until then let’s play it as safe as we can because we can’t escape the results, whatever they may be. And we have some precedent that should make us get very, very serious about the issue. If you want mathematical details, please let me know. A bit off topic, but is there a way to share this essay on facebook? My wife and I don’t do Facebook, either. I mean, I have an account, but it has been months since I posted anything. I loathe Zuckerberg. I might say more, except I wouldn’t want to hurt anyone’s feelings. However, might I suggest creating a Facebook account strictly for the purpose of adding a Facebook share button? Add a little text to your Facebook page that any and all responses should be at your blog and that your account is strictly so that people can share through Facebook. For reasons I can’t quite fathom, a fair number of people use the service and I suspect it might increase traffic. I have added a link to this indirectly using “How Do We Know Global Warming Is Real?” article in slate.com. The thing is that climate denialers, gamergaters, racists etc. don´t really care about being right; what they do care about is “winning”. And they “win” by being very LOUD and use all channels possible to drown out other voices. And it works all too well and in the case of climate denialers that is a “win” that spells global disaster. So it is very important that information like this essay is easy to spread. You don´t really have to be loud, but you have to be there, wether “there” is Facebook, Google+, Reddit or even 4chan.org. Do you have a FB account? If so, just paste the link into a status box. Voila! If you like, you can add some comment as a ‘teaser’, but that’s optional. By default FB will display a thumbnail for the link, which is convenient. Douglas, we have good estimates on how much carbon we’ve burned since the beginning of the industrial revolution. Even better since 1900. The amount of CO2 we’ve pumped out is about twice as much as the atmospheric concentration has risen in the same time. Pure arithmetic: if we’ve emitted twice as much CO2 as has increased in the atmosphere over time, we must be the cause. Unless – and here is where the magical thinking starts – there is some mechanism in the biosphere that recognizes anthropogenic CO2 and selectively sequesters all of it, and a different, natural source that happens to have emitted just as much as we did in exactly the same period. Hell of a coincidence. No such selectively sequestering mechanism has been imagined, much less identified, and no source has been detected that has emitted such a colossal amount of CO2 in such a short time and continues to do so. We see this rise being played out year after year, as well as the small wiggles from natural variation. Barton’s cited other lines of evidence (eg change in isotopic ratio) corroborate quantitatively. The CO2 rise is mostly from fossil fuels and partly from human-induced land use changes. We have observed more CO2 in the oceans over the years, so this ever-increasing excess CO2 in the atmosphere isn’t coming from that great reservoir. It’s absorbing some of it. But you don’t even have to dig that deep. Arithmetic will suffice. It’s because of us. Unless one happens to believe in magic. Outstanding presentation I live in Puerto Rico and surfed in my younger days, I had a multiyear colection of the satellite pictures from space. In those days(early 70’s) cold fronts would go over the island a reach the Virgin Islands or beyond. Nowdays they rarely do. We all need to prepare for big changes ahead. The earth is estimated to be 4.54 plus/minus .05 billion years old. What is now referred as The Great Ice Age started approximately one-million years ago. Since then, there have been many glaciations, the last major ice sheet covering the North Central U.S. maxed out about 20,000 years ago. Since then, there have been numerous and significant fluctuations, but with a definite decline in glaciers due to non-anthropological (non-man-made) causes. Even without the recent exacerbation of sea-level rise caused by man, sea-levels would have risen, but neither as alarming or fast as the current scientific data proves. One interesting facet of sea-level rise is that when the sea-levels began their natural rise, about 20,000 years ago, an estimated tens of thousands of people lived in a land bridge that connected Great Britain and Europe. This area, now called Doggerland, is now being actively explored by marine anthropologists who have uncovered remnants of ancient civilizations. Best estimates are that present North Sea levels have risen approximately 490 feet since the last glaciation (Interglacial Period). Since the Earth has been cooling over the last several thousand years, my assumption is that sea levels would be slightly declining without Man’s influence. We will see of any of those find their way to this comment section since I linked to this site. Pretty appalling. But I’m not going to create an account to argue with that lot, I’m afraid. So. Plant more trees. A good theory is the earth is try to cool itself. We need more shade. This is the point in question. In many ways, the cure seems to be worse than the illness. Maybe a cure is needed, but it must be balanced somehow. Reducing global warming will “ruin the economy” much as opening your parachute will slow your progress toward the ground.